This week, we’re blending optometry with our mixology. For whatever reason, a pretty large majority of the people in my life need to wear eyeglasses or contacts. Not me, As a nerdy youngster, I almost envied my friends’ problematic eyesight; wearing glasses would be a kind of truth in advertising. My soul was bespectacled, damn it! All these decades later, I still don’t need to wear any kind of prescription eyewear, but at some point after I turned 35 or 40, presbyopia began to set in. Like millions of others, I now have to wear reading glasses when reading books with normal sized print for any length of time, despite having no problem at all seeing at pretty far distances. For shorter sessions, I often tell myself I can manage without assistance. These would sometimes include recipes out of The Savoy Cocktail Book. I should have known better. 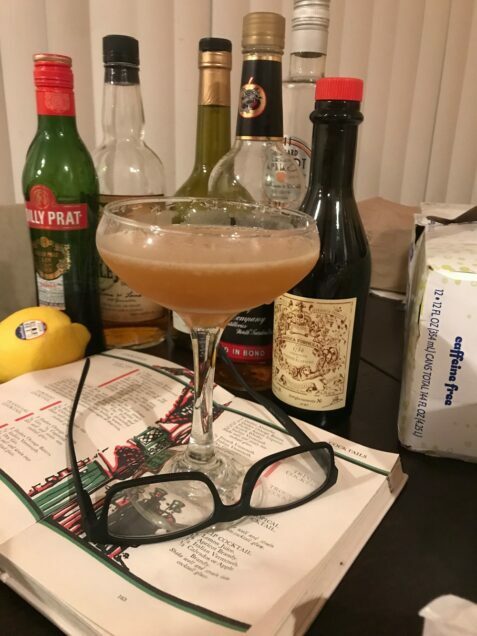 The Tulip Cocktail featured in Harry Craddock’s masterwork is supposed to contain equal parts of sweet vermouth and apple brandy, and half as much of lemon juice and apricot brandy/liqueur. However, since my unaided eye was unable to discern the difference between 1/3 and 1/6 in small print at low light, I thought the Tulip surely contained equal parts of all the ingredients and didn’t think to double check with a pair of specs. Strangely enough, I like it this way. And so we have another of my occasional accidental cocktail creations. Combine all of the ingredients in a cocktail shaker and shake very, very vigorously. You want this one to come out good and icey. Strain into chilled cocktail glass, and see if you spot the tiny ice crystals. If so, you might be too young to fully appreciate this week’s mixed drink. 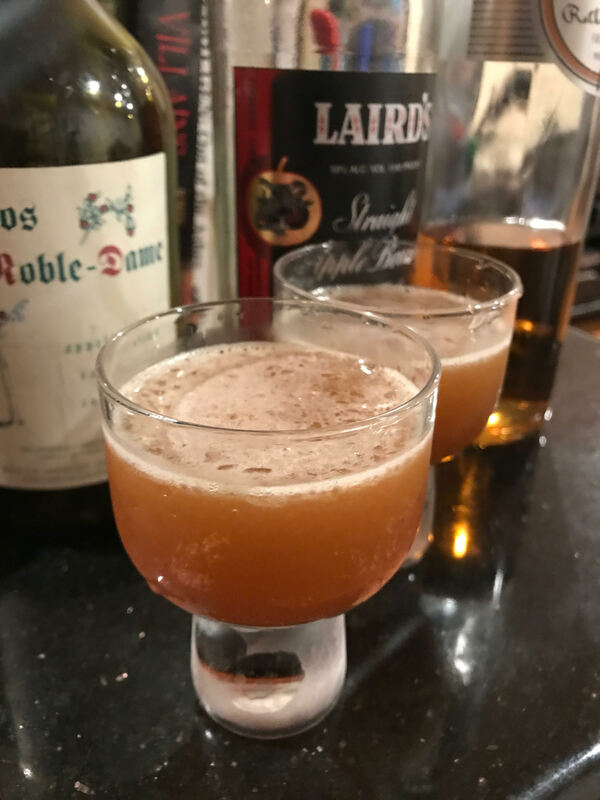 My apple brandies this week were 100 proof Laird’s Straight Apple Brandy, Laird’s Applejack 86, and merely 80 proof Calvados Roble-Dame. My sweet vermouths were my two old standbys, Noilly Pratt and Carpano Antica. This is a drink that just wants to be sweet, so the much less expensive and less complex/bitter NP won the day, but I have to call it split decision among the three good apple brandies I’ve got in the house right now. The richness of Laird’s Straight Apple Brandy gave the Prybopic Tulip a nice hint of caramel; the relative dryness of the calvados gave it a tang and a few borderline-floral notes I also quite liked, and the Applejack 86 had less complexity to it, but was nevertheless delightful. Now, the question becomes, what of the drier, boozier drink that was actually in Mr. Craddock’s book? Next week, it will be time to put on my specs and get to work.